A total of 10 firefighting engines, seven JTs and three Quick Response Vehicles were pressed into service to douse the fire. 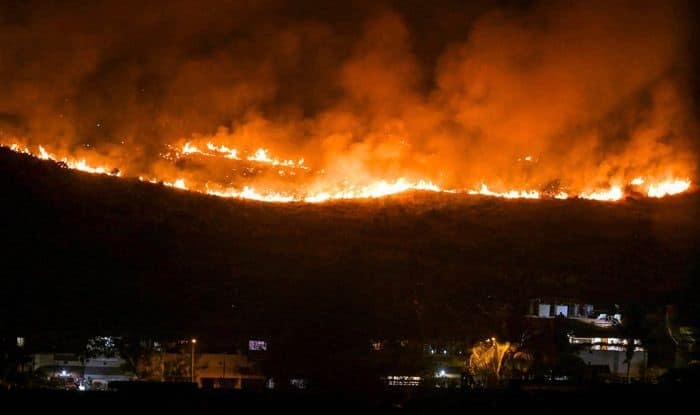 Mumbai: The massive fire that erupted on Monday near the Aarey Colony forest in Mumbai’s suburban Goregaon was doused on Tuesday morning. As per initial reports, no causalty or property damage was reported. The blaze started around 6:30pm in an open plot near an IT Park along the General Arun Kumar Vaidya Marg in the western suburb, located adjacent to the Colony. “Fire personnel are trying to put out flames with ‘beaters’, the branches of trees that are being used to create a fire break, as they have no access to fire appliances,” Chief Fire Officer Prabhat Rahangdale said on Monday. “Until 7.30 pm, the blaze remained confined to trees, dry leaves etc. Within a distance of 3-4 km from the spot of fire. However, in the night it started moving towards the residential localities,” he said. A total of 10 firefighting engines, seven JTs and three Quick Response Vehicles were pressed into service to douse the fire. Apart from fire personnel, forest officers and Mumbai police personnel also helped in putting out the flames.